The curry powder and cranberries in this curried chicken sandwich provide you with an antioxidant level of over 1,000 ORAC. Photos courtesy of McCormick. 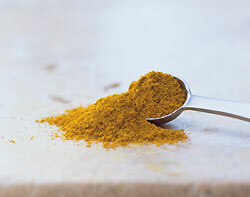 Yellow curry is one of the Seven Super Spices, which all have high levels of antioxidants. Though what we think of as “yellow curry,” or curry powder, is actually a blend of spices that usually contains coriander, cumin, fenugreek and turmeric. Curry powder has 970 ORAC per tablespoon to begin with. But since it’s actually composed of a number of spices already, it lends itself well to mixing with even more spices, allowing you to get an even higher dose of antioxidants. Click here to read about all the Super Spices. 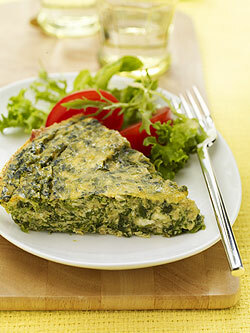 Ideal for a weekend brunch or light supper, this colorful tart will impress your guests. Surprise, it’s also packed with antioxidants! Add whole wheat muffins and a fruit salad for a perfectly easy menu. Heat oil in large nonstick skillet on medium-high heat. Add onion; cook and stir 5 minutes or until tender. Remove from skillet. Cool slightly. Mix milk and flour in large bowl with wire whisk until smooth. Add eggs, egg whites, curry powder, sea salt, garlic powder and ground red pepper; whisk until smooth. Add cooled onion, spinach and ricotta cheese; mix well. Pour into 9-inch deep dish pie plate sprayed with no stick cooking spray. Sprinkle with Parmesan cheese. Bake 30 to 35 minutes or until top is golden brown and center is set. Let stand 10 minutes before cutting into serving-size pieces. 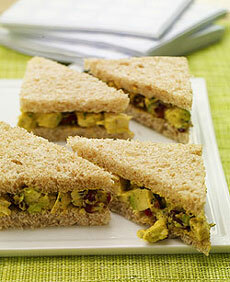 Avocado, cranberries and curry powder combine to make this vibrant and healthful chicken salad. You can also opt to serve it on greens as a salad instead of using it for sandwiches. though if you put the two together with mayo and chicken, you’ve got a snazzy chicken salad. Mix mayonnaise, curry powder and salt in large bowl until well blended. Add chicken, avocado, cranberries and cilantro; toss gently to mix. Divide chicken salad evenly among 4 slices of bread. Top each with a lettuce leaf and remaining slices of bread. Recipes and photos © 2008 McCormick. All rights reserved. Other material Lifestyle Direct, Inc. All rights reserved.